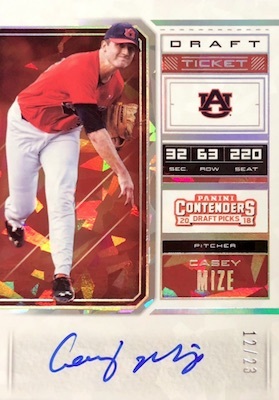 Largely based around images for past and present stars taken from their collegiate careers, 2018 Panini Contenders Draft Picks Baseball contains six autographs in each Hobby box. Just like 2017, the autograph-per-pack format also provides a glut of base, variations and inserts. 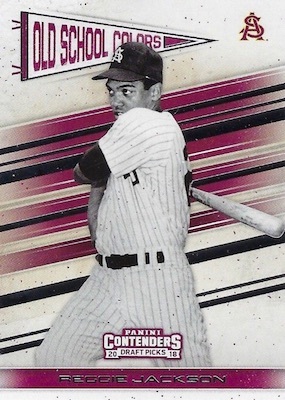 Showcasing top MLB talent during their formative years, the 2018 Panini Contenders Draft Picks Baseball base Season Ticket set offers 25 cards with a lineup of parallels that average one per box overall. 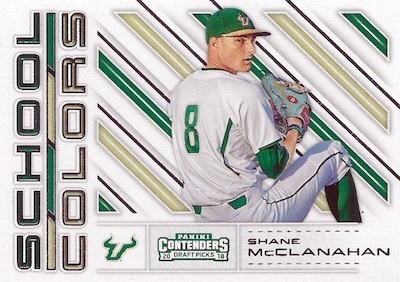 The Base Season Ticket cards, Season Ticket Variations and inserts combine to supply 100 cards in each box. 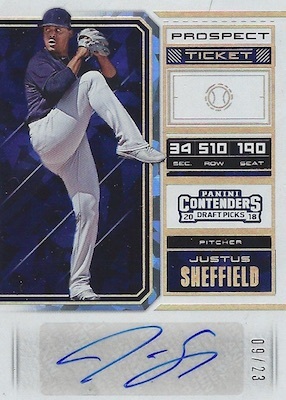 However, the 2018 Panini Contenders Draft Picks Baseball checklist really gets moving with the signed options. 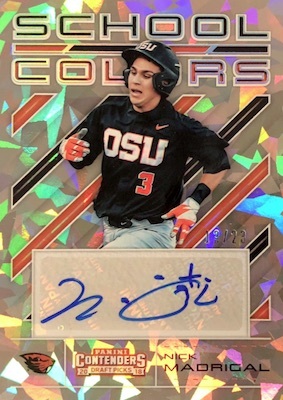 The Draft Ticket autographs highlight those players selected in the 2018 MLB Draft and the RPS Draft Ticket subset features on-card autographs for key names taken in the first three rounds. Parallels include Prospect Ticket (#/99 or less), Cracked Ice Ticket (#/23 or less), Playoff Ticket (#/15 or less) and Championship Ticket (1/1). Stepping away from the NCAA focus are the Prospect Ticket and International Ticket autographs. A key signature choice here is Juan Pablo Martinez, the Cuban signing for the Texas Rangers. 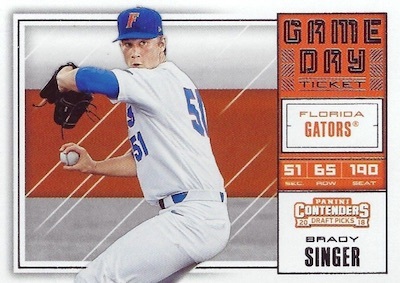 While the Ticket cards are a huge component of the autographed content, 2018 Panini Contenders Draft Picks Baseball has a few more hits up its sleeve. The Old School Colors Signatures insert looks a bit further back for some all-time great college stars. There is also the dual-player Collegiate Connections Signatures line pairing two players from the same university. PARALLEL CARDS: Draft #/99, Cracked Ice #/23, Diamond #/15, Building Blocks #/10, Fame #/5, Championship 1/1, Printing Plates 1/1. Shop 2018 Contenders Draft Picks Baseball autograph on eBay. TICKET PARALLELS: Prospect #/99, Cracked Ice #/23, Playoff #/15, Championship 1/1, Printing Plates 1/1. 18 cards. Variations have bolded "V" on the back. TICKET PARALLELS: Draft #/99, Cracked Ice #/23, Playoff #/15, Championship 1/1, Printing Plates 1/1. PARALLEL CARDS: Cracked Ice #/23, Championship 1/1. Any idea on how to spot the variations? For the autographs, they put a bolded “V” on the back but not sure on the unsigned base Season Ticket cards.